News - The Tibetan Community of Australia (Victoria) Inc. The Melbourne Tibetans in their cultural attire gathered at the Community Hall at Grattan Garden in South Yarra on 12 December 2016, to celebrate the 26th anniversary of conferment of Noble Peace Prize on His Holiness the great 14th Dalai Lama. The community president inaugurated the event offering Tibetan white scarf to the portrait of the His Holiness the Dalai Lama and lighting the butter lamp, praying for peace in the universe and longevity of His Holiness the Dalai Lama. Followed by reading the Tibetan Political Leader's statement on the occasion to the audience. All the people gathered at the event enjoyed the traditional songs and dances, western dances, party games and delicious foods. The Executive Members of the community are deeply grateful to all the voluntary contributor of the event, which made it a huge success and we extend our heartfelt gratitude to all the contributors, helpers, supporters and audiences. See you all in LOSAR gathering. Around 50 thousand peoples have flocked at the State Library of Victoria to support the People's Climate March on 27th November 2015. Among them were nearly 100 Tibetans to support the People's Climate March in general and specifically to highlight the climate situations in Tibet because of environment destruction under the name of development. The Tibetans carrying a banner of Climate Action for Tibet led by the Central Tibetan Administration and display cards highlighting the geographical importance of the Tibetan Plateau to neighboring Asian countries for its source of water had marched with the peoples to the Parliament of the Victoria state. 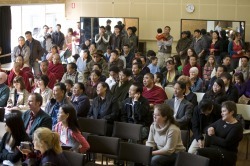 The Tibetans in and around the Melbourne City have gone for a preliminary voting of the Sikyong (Political Leader) and the members of Tibetan Parliament in Exile on 18 October 2015. Since the Tibetans in Australia and Asia region has been granted with the opportunity to choose their own representative in the parliament during the last parliament session. Therefore, an interactive debate session with the candidates running for the parliament seat representing 'Australiasia' came in handy for the voters to know and choose the candidate. Nearly two and half hundred people voted on that day and the head Tibetan Election Commission has set 20th March 2016 the final election day for the Sikyong and members of the Tibetan Parliament in Exile. Please, free yourself from all engagement and GO TO VOTE. The newly elected 17th Executive Members of the Tibetan Community Australia, Victoria has organized the candidates debate for the recently approved only seat in the Tibetan Parliament in Exile to represent the Tibetans living in Australia and Asian countries other than India, Nepal and Bhutan, and which is termed as "Australiasia region". It was held on the afternoon of 27th September 2015, between 1:00 PM to 5:00 PM. All the nine candidates contending for the seat in TPiE from different states of Australia acknowledging the importance of the platform have participated in the debate and utilized the opportunity create an interactive session to inform more about their work planning and answering the questions put up by the audience. The Executive members have tried its best to establish contact with the only candidate contending for the seat from Taiwan but went in futile. However, the President Mr. Tsering Dorjee has informed the audience about the candidate contending for the seat from Taiwan in his opening speech. We are pleased to see the responses from the each and every candidates, and also from the audience taking serious initiative in quest of the right candidate. Our sincere gratitude to all the participators and the audience. 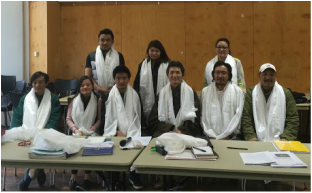 The members of Tibetan Community Australia, Victoria went ahead with electing seven new Executive Members on 2nd August 2015 and hand over of the charges and belongings took place on 12th September 2015. The new Executive Members of the community on behalf of all the members are thankful to the previous energetic team of the 16th Executive Members for their dedication and tireless effort towards the cause of Tibet and well being of the members. I am very pleased to inform you that on Sunday 3rd August 2014, the TCV had a very successful AGM and election of 7 new executive committee members. Representing a good mixtures of age, gender and educational backgrounds, I am confident that the new Committee headed by Mrs Nawang Choden as the President will bring a fresh idea and development for the Victorian Tibetan Community and I request all the members, Supporters and Friends of Tibet to please provide your continuous support for them. On behalf of the outgoing Committee members I sincerely thank you all for your support and cooperation during our two years tenure. I wish every success for the new Committe. 3. Four new Tibetans have arrived safely in Melbourne on Monday 3rd March 2013 under the Australian governement's humanatarian program. They were received at the airport by our Vice President, Mr Tenzin Lobsang and Culture/Sports Coordinator Tenzin Yeshe la and a driver from the AMES. We welcome them to Australia and wish them every Happiness and Success in beginning a new life here in Melbourne. Dr Tsewang Tamdin, Vice-chairman to the Medical & Astrological Committe of Men-Tsee-Khang, and personal physician to His Holiness Dalai Lama will travel to Australia this year during the time of His Holiness The Dalai Lama's visit to Australia in June. During his stay he will spend 3 days in Melbourne with a program of Public talk and two days of consultations, June 14th - 16th. The Tibetan Community of Victoria is proud to host Dr Tamdin for his first visit to Melbourne. The Melbourne Tibetan Soccer Club has won the 2013 Interstates Tibetan Soccer tournament! Congratulation and thanks to all the players, coaches and supporters. Well done boys. Look forward to seeing the Cup safely arrived in Melburne. In Melbourne over 300 Tibetans, Tibet friends and supporters including Chinese and Vietnamese began the 54th Uprising Day at the city centre Federation square with 2 min silence and prayers for brave Tibetans sacrificed their lives for Tibet including 107 self-immolators. The participants were wearing placards of 107 Self-immolators detailing names, photos, ages. From Federation Square the crowd walked 10 km through busy streets to the Chinese Consulate. Among the guest speakers was Hon. Pema Chhinjor, the Minister for Religion and Culture of Central Tibetan Administration who reminded the crowd that we are not opposed to Chinese but against the repression of Tibetan language, culture, religion and basic human rights by the Chinese government. He said that Tibet does not want separation from China but autonomy within China. He also said we should reach out to Chinese friends both in Australia and worldwide to help us in this cause to stand up and speak out to their own government and for the rights of Tibetans. The President of the Melbourne Tibetan Community, Mr Samdup Tsering in his speech urged the Australian PM Julia Gillard to make a strong public statement of concern over the situation in Tibet and China to allow foreign journalists unfettered access to all the Tibetan areas. A member of the Chinese Tibetan Friendship Association and the Chinese Democracy Party, Mr Frank Ruanjie said that freedom for Tibet also means freedom for China. There are many Chinese in Australia and elsewhere who are in support of securing genuine autonomy for the Tibetan people and will stand beside Tibetans in their fight for human rights. The President of Vietnamese and Nagaland Communities also spoke and reassured their continued support and solidarity with Tibetan people in their struggle for freedom and justice. The Nagaland Community President MR Visier Sangu began his speech by paraphrasing Albert Einstein - "evil will only take hold not only when evil doers reign but when good men sit by and do not oppose evil". At the Chinese consulate the statement of Sikyong Dr. Lobsang Sangay on the 54the Anniversary of the Tibetan National Uprising Day was read out. After a series of speeches, led by Mr Tenzin Lobsang, the Vice President of the Melbourne Tibetan Community the crowd sent their messages to the Consulate Office on top of their vices and very clearly that to Free Tibet, Stop Cultural Genocide in Tibet, Stop Killing in Tibet. Today Kalon Pema Chhinjor of Department of Religion and Culture graced the gathering of Tibetan community of Melbourne at Tara Institute Melbourne. The function began with the singing of Tibetan national anthem followed by a minute silence in recognition of the sacrifice made by 107 self-immolated Tibetans. Ngodup Gyaltsen Udak, Executive Secretary, Tibet Information Office, Australia introduced and welcomed Kalon Pema Chhinjor La. Then Tibetan community Melbourne President Mr Sandup Tsering la briefed Kalon about the Community annual events and specifically recent activities undertaken to spread and inform Australians about the situation inside Tibet. He also briefed about the upcoming festival of Tibet in Melbourne to coincide with the 78th birthday celebration of His Holiness the Dalia Lama. This was followed by speech from Kalon Pema Chhinjor la. Speaking at the gathering, he stressed on the responsibility of each and every Tibetan and to take sincere and active part in Tibetan democracy voluntarily. He also updated the audience about the current situation in Tibet and also talked about the well organised functioning of democratically elected Tibetan government under the leadership of Sikyong Dr. Lobsang Sangay. He spoke about the origin and importance of Lhakar movement. He concluded his talk by acknowledging the good work initiated by the Melbourne Tibetan community. Lastly he encouraged all Tibetans to preserve our rich culture and authentic religion which is highly regarded all over the world. 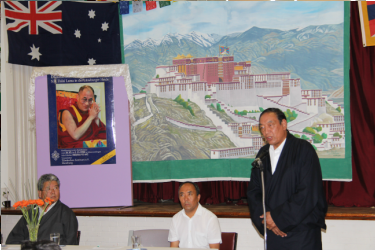 The function ended with vote of thanks from Vice President of Tibetan Community Melbourne, Mr Tenzin Lobsang. After the function, a sumptuous lunch was served. 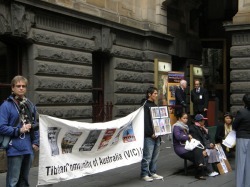 On 10th December the Tibetan Community of Victoria gathered together in front of the front court yard of the State Library to observe Human Rights Day, commenmorate the Nobel Peace Prize to His Holiness The Dalai Lama and to join the Global Solidarity Day as called upon by the Central Tibetan Administration. Over 300 people participated including local Tibetans, members of the Chinese Coalition of Democray Groups, Australian Friends and Supporters of Tibet. Two minutes silence was observed to homage all the Tibetan martyrs who sacrificed their lives for Tibet. Led by Ven Thupten Khedup from the Gyutoe Monastery, prayers of the Words Of Truth and mantras were recited for the World Peace and quick resolution to the crisis in Tibet. The Community President Mr Sandup Tsering delvered the speech focussing on the eacalating wave of self-immolation inside Tibet and how people in free countries can support Tibet. Mr Frank Raunjie as well as a young Chinese friend gave a moving speeches to show their heart felt support for Tibet. 500 copies of the the publication "Current Human Rights Situation In Tibet" by DIIR was distributed. The participants then marched to the Parliament House through the main roads of the Melbourne city calling for "Free Tibet Free China, Human Rights for Tibet, Dialogue Dialogue No More Guns, Stop Cultural Genocide in Tibet." The Community Vice President, Mr Tenzin Lobsang gave a inspirational speech at the Parliament House. The event was concluded with singing of the Tibetan National Anthem. Australians and Tibetans living in Melbourne Australia showed today that there voice and there basic human rights such as freedom of speech, freedom of religion and free expression of culture, can and will be upheld in a civil and democratic society. REWARD THE DALIA LAMA, REWARD PEACE and SAVE TIBET. The rally was a dramatic show of Tibetan Culture, the Australian public's deep concern for Tibet and its people and a free voice for member of Chinese and Vietnamese community in Melbourne. Rally organisers Daniel Prokop and Elyjah McLeod spoke about the vision of the campaign and a belief that His Holiness Dalai Lama should be rewarded for all his efforts to uplift and bring peace and harmony to our planet, That his tireless efforts for the betterment of the world in both its humanity and environment be rewarded by the international community getting behind his very simple and clear message, a dialogue based solution with China to end the humanitarian tragedy inside Tibet and the end to the destruction of his peoples way of life and very precious land and resources. Australian author Daniel Prokop launched his book inspired by his connection to Tibet called "Taking it With you". available now on Kindle world wide, with a % proceeds being donated to Tibet organisations and charity's. In a wonderful display of support, Mr Frank Ruanje of the Chines democratic party and chief editor of the Tienanmen times spoke of the time for change from the hard line communist party strategies and golden age of peace and democracy for China and its people, in-turn full support for Tibet's wish to have genuine autonomy, freedoms of religion and basic human rights under a greater Chinese rule. Bon Nguyen, the president of the Melbourne Vietnamese community voiced to rally organizer Elyjah McLeod of his communities full support for His Holiness the Dalai Lama and the struggle of the Tibetan people, Vowing to be of continual support for Tibet's dream of freedom. Samdup Tsering, President of the Melbourne Tibetan community spoke passionately and directly about the violent assault and decimation of his people. He urged our Australian community to take up the issue with member of parliament and heads of government to please intervene on Tibet's behalf in this very difficult time for Tibetans and voiced that Tibetans will never give up on there wish for freedom and a return of His Holiness the Dalai Lama to Tibet . Tipa graduate and greatly talented Tenzin Yeshe performed a traditional dance dating back to a vision of the 5th Dalai Lama, offering his wisdom and words about his culture and the dance to help purify the space in which we all gathered. 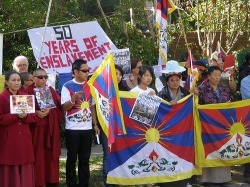 The Tibetan Community marched from Federation square and staged peaceful yet defiant demonstration outside the Chines Consulate in Toorak, with support of the Australian Federal Police . The Community chanted prayers, Sang the national Anthem and more speeches people form the Chinese Democratic Party were offered directly in front of the embassy in Mandarin. Tibetans spoke powerfully outside the embassy of there oppressors. Energy and support is high, the movement is mounting, Australians are more aware of the current situation and many of us vow that the lives of those that have gone before us in such deeply agonizing ways will not be in vein. The brutal and violent campaign waged by China in Tibet, to smash the Tibetan spirit and annihilate there presence in the world will never Win. Tibet will be victorious. On Saturday the 15th of September 2012, the International Flame of Truth Torch Relay for Tibet arrived in Melbourne. 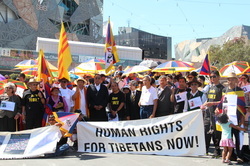 It was greeted at Melbourne’s Federation Square by a large and colourful group of over 200 Tibetans and their supporters, plus many more interested onlookers. Followed by a minute mourning and prayer for the Tibetan martyrs who have sacrificed their life for the Tibetan cause , speakers from the Tibetan Community of Victoria, the Chinese Democratic Coalition Group, The Vietnamese and Mongolia Community of Victoria and the People’s Chapter for Non-violence all spoke about the desperate situation in Tibet and the reasons why 51 Tibetans have taken the measure of self-immolating since 2009. While the Chinese government claims that it has brought development to Tibet, the roads, railway lines, airports and housing schemes it boasts about building are all for the benefit of Chinese colonizers and the huge Chinese security and military forces there, not for Tibetan people. Traditional Tibetan ways of life, such as nomadic herding, are being forcibly stopped and herding and farming people relocated to villages where they have only marginal roles in the Chinese controlled new economy as day labourers or even no livelihood at all. Such measures as forced resettlement of nomads are scarcely being taken to make life better for Tibetans. Poverty is rife for Tibetans from all backgrounds. Tibetan people face discrimination from their occupiers in every sphere of life, not just employment. Chinese is becoming more and more dominant in the schools, which are also vehicles for Communist Party propaganda. The monasteries are also subject to strict control by Communist Party officials and monks and nuns are subject to forced “patriotic re-education” and made to denounce HH the Dalai Lama. Longer-term, the threat is whether a distinctive Tibetan culture can survive at all under Chinese occupation. Tibetan language and religion are under threat of eventual extinction from the efforts of the Chinese government to “sinicize” the Tibetan people. Further, the Tibetan people have been given no opportunities to express their grievances. Protests have always been met with brutal repression from Chinese security forces. Since the 2008 uprising, repressive security measures have intensified. As the speakers noted, nobody could be expected to simply submit to such things. That is the context for understanding why so many people have chosen to sacrifice their own lives by self-immolating since 2009. Despite the seriousness of the situation, the mood of the rally was very buoyant. After the speeches and some musical performances of songs of Tibet Unity and March to Freedom, the Tibetan National Anthem was sung to conclude the formal event at Federation Square and then the crowd marched through the city centre to Parliament House. On next day the Flame of Truth was handed to Mr Frank Ruanji , the President of Chinese Democracy Coalition Group in the highly Chinese populated Melbourne suburb Box Hill. The members of the Chinese group were wearing T-shirt with two sentences in Chinese character calling for the unity of all Chinese nationalities to bring down the totalitarian regime of the Chinese Communist party. Together with the Tibetans, the group walked through the busy streets of Box Hill calling for FREE CHINA FREE TIBET. Mr Sandup Tsering, the President of the Melbourne Tibetan Community and Mr Frank Ruanji, the President of the Chinese Democracy Party and the Chief Editor of the Chinese news Tiananmen times both emphasied in their speeches the importance of all working together to bring down the CCP for the sake of freedom and democracy and for world peace and stability. During the four days relay in Melbourne, a Tibet information desk has been oraganised at the centre of city to collect signatures for the petition to UNO and handout the pamphlets on ‘Flame of truth’. The Flame of Truth will also be received by the heads and members of the major Tibetan Buddhist Centres in Melbourne. On Wednesday 19th Sept morning the Flame of Truth will travel to Hobart, the capital city of the Australian state Tasmania. Since 27th February, 2009 47 Tibetans including monks and nuns in Tibet have self-immolated to protest against the Chinese government’s failed policies and violation of human rights in Tibet. The most recent being a Tibetan woman identified as 26 years old Dolkar Kyi in Eastern Tibet yesterday. Dolkar’s self-immolation protest comes just a day after Lobsang Tsultrim, a 21 year of monk at the Kirti Monastery set himself on fire in the beleaguered Ngaba region. Dr Lobsang Sengay, the PM of the Tibetan government-in-exile has called the self-immolation “political action” and blamed the China’s failed policies in Tibet – founded on political oppression, social marginalisation, cultural assimilation, and environment destruction as the root cause of the protest. 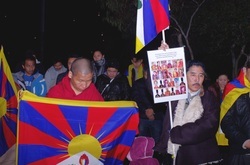 The Tibetan community of Melbourne held a peaceful candle-light vigil on Wednesday night at the Federation Square in honour of the Tibetan men and women who have sacrificed their lives for Tibet, the participants observed two minutes of silence and offered prayers. In his speech, highlighting the deteriorating human rights situation inside Tibet, president of the Melbourne Tibetan Community, Sandup Tsering blamed China’s policies of “colonisation and sinicisation” of Tibet for the ongoing wave of self-immolation inside Tibet. Mr Tsering also called upon Australian Foreign Minister Bob Carr to honour his promise that he made in March this year to send an Australian delegation to gain firsthand knowledge of the situation inside Tibet. Today, we have gathered here on a solemn and very sad occasion. An earthquake hit Kyigodu, in an eastern part of Tibet, causing massive property damage and claiming many lives. The official record of lost lives stands at 2046. I would like to point out an anomaly between the Chinese government's claim of the earthquake as 7.1 on the Richter scale and geology experts registering 6.9 on the scale. I want to emphasize this issue. By claiming the higher number, the Chinese govt. tries to blame the destruction and loss of lives on the magnitute of the earthquake, thereby shirking its responsibility over negligence of the building standard. This excuse saves them face and accountability. Everybody here would be aware of some of the important dates in Tibet's relatively short history during the 60 years of China's colonial rule. The ten year invasion, begun in 1949, culminated in 1959, with the escape of His Holiness Dalai Lama and 80,000 fellow Tibetans into India and a life as refugees. Since then, there have been two significant protests against a ruthless Chinese ruler. The 1987-88 and 2008 protests, were both crushed violently. Prior to the latest protest in 2008, the world paid scant attention to the problems faced by the Tibetans. The world wide protest and the uprising within Tibet , which coincided with the 2008 Beijing Olympics drew international attention to China's so called "Harmonious Society" propaganda. The international media began to pay as much attention to the Tibetan situation as it gives to Taiwan's relations with China. Tibet became a sharp thorn for China in it's international relations. It is no longer a small pebble in China's shoe, and not just creating a small discomfort. Our struggle for a free Tibet has been fought with great courage, determination and self sacrifice. We have shown determination and unfailing aspiration for a just cause. We have surprised the Chinese govt. and her public. Their self delusional belief that the Tibetans have been brain washed with communist propaganda and economic progress has been fully exposed. This is a wake-up call for the Chinese Govt. Information technology has played a vital role in disseminating information on the real situation in Tibet. Despite a complete shutdown of all communication, we have managed to acquire proof of ruthless crack downs on unarmed civilian demanding human rights. We now have video clips, photos and personal accounts etc., of China's cruel treatments of Tibetan protesters. The outside world has a clearer picture of the situation in Tibet. 1. Protest and persuasion: These methods have been practiced within and outside Tibet. Protests within Tibet have been constantly crushed by military force. Protests outside Tibet have raised awareness and kept the issue alive in the international community and give sustenance to Tibetans and especially Tibetans within Tibet. 2. Non-cooperation: This method involves withdrawing cooperation with the ruling junta. For example, the marginalized citizens can refuse to pay tax. They can emphasize their distinctive culture from the rulers, by wearing their traditional clothes, consuming traditional foods and insist on observing traditional religious practices etc. During the British Raj era in India, Mahatma Gandhi, the Indian leader, implemented the non cooperation method by abandoning western dress code, buying Indian made goods, boycotting schools etc. This method played a pivotal role in gaining India her freedom. A similar method is being practiced in some parts of Tibet. It is given the name "Lhakar", which in Tibetan means White Wednesday. It is observed on Wednesday and coincides with the birthday of His Holiness the Dalai Lama. On this day Tibetans spoke only Tibetan language, ate Tibetan food, wore Tibetan clothes, bought goods from Tibetan shops etc . This method of protest is widely practiced and is being extended to other days of the week. There are cases of some Chinese merchants having to leave the area from lack of of trade. This type of protest does not produce immediate results. Yet it is very effective and yields concrete results. It is less dangerous and not violent. Exiled Tibetans should be inspired by our fellow Tibetans in Tibet, undertaking such activities, under very difficult conditions. 3. Intervention: Undertaking a direct action to stop an unfair and unjust decree against the ruling power can produce favourable results. Yet it can be dangerous, as the ruling power can decide to use brute force, threats of imprisonment and other state instruments of punishments. Let me relate to you of an incident in Markham, a mountainous region in eastern Tibet, with a population of nomadic people. The Chinese mining companies, with full government backing, were mining the area's gold, uranium and other minerals. The companies were dumping chemical waste into the natural environment, especially into the rivers and creeks. This resulted in much sickness and death of animals and inhabitants. Their way of life and livelihood was threatened. After the rejection of repeated pleas and petitions, five hundred nomads decided to take a direct protest action. They all lay down to block traffic on a bridge. The blockade lasted for fifteen days. They suffered constant harassment, beatings and death threats. Faced with mounting criticism, pressure from the international community, and the firm resolve of the local inhabitants, the Chinese finally had to back down. China has become a powerful and strong nation in economic and military terms. However, their political strength is very fragile. The civil society is ruled by elite, one party, dictatorial regime. Their main weapon is to coerce the population by fear. This coercive tactic requires the ruling clique to threaten the public with a constant military and police show of strength. The government denies and manipulates information. Arbitrary threats, arrests and detentions, leave the population in fear and uncertainty. Tibetans demand basic human rights, freedom of speech, and right to practice our culture. We do not want alien state edicts to interfere with our spiritual and religious practices. A democratic system and rule of law will guarantee equality, respect and harmonious coexistence. I am sure that a respectable and reasonable Chinese public would share in this opinion. The aspirations of human beings are the same everywhere. We are endowed with these rights and when a dominant power abuses these rights, the persecuted and oppressed people should rise up non-violently and demand their rights. China can learn some valuable lessons from India's political and governing structures. It has had a very long, stable government and the largest democratic system. A very diverse races, religions and languages etc live in a comparatively peaceful co-existence. People have the choice to vote in a political party to represent their best interests. I came to overhear the personal histories and hardships of my parent, when they were chatting idly with their friends. These generational experiences and memories are hardly ever passed on to the next generation. We should bring about a change in this neglect. The elders should tell their experiences and memories to our younger generation. Our youth should learn from the sufferings of our parents. This is how we can preserve our culture and traditions. We can add more meaning to our lives. Through their stories we can find sustenance and solutions to help our fellow Tibetans, who are still suffering under a cruel and foreign regime. It is inevitable that change will occur in China. Change is constant throughout human history. Therefore, it is vital for us not to lose our determination and faith and have long term vision. A persistent force of wind, will, over a period of time, even erode the great wall of China. The force of the wind will not be diminished after the collapse of the wall and the wind will keep on blowing. Our struggle for a free country should be like the perennial rivers of Tibet. China has gotten rich during the recent economic boom. Many of these newly rich Chinese have invested in their future by sending their children, and even migrating, to western countries. This shows that they have little faith in their government. They do not feel secure in their future. It is indeed a miracle that such a corrupt and bloody regime survived, as it has, the last sixty years in power. Finally, I would like to say that regaining our freedom is just a matter of time. No miracle is needed. It is natural and is just a matter of time. 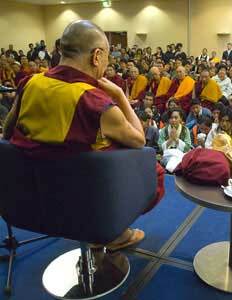 Sydney: His Holiness the Dalai Lama has begun a two-day teaching on “Awakening the Mind” in Sydney this morning. Nearly 5,000 people are attending the teaching. The morning session began with a traditional indigenous “welcome to country” from the Cadigal people of the Eora aboriginal nation, the traditional owners of the Sydney area. Flanked by Buddhists from Thailand, Vietnam, Tibet and many other countries, His Holiness said he was very happy to be giving another teaching in Australia, and in particular to be explaining Nagarjuna’s Commentary on Bodhichitta, which he said he considers a “sacred, important and sophisticated text”. In his opening remarks His Holiness spoke of the potential of all the world’s great religions to bring inner peace, arguing that while differing in their philosophy, all religions carry the same message of tolerance and compassion. Beginning the teaching, His Holiness emphasized that for a happy life and a peaceful community we must train our mind and look more at our inner world, explaining that all worry and frustration come through ignorance of the nature of ultimate reality. During the lunch break His Holiness held a meeting with Australia’s Tibetan Community. Around five hundred Tibetans were present, with many travelling from interstate. Over one hundred members of the Mongolian community also joined the meeting. In a half hour address His Holiness focussed on the importance of education, encouraging more of Australia’s Tibetans to try to go to university in order to learn skills and professions that will benefit and strengthen the community. At the close of the afternoon session all those attending the teaching received a packet of seeds blessed by His Holiness. In recognition of the 20th anniversary of his Nobel Peace Prize on 10 December, His Holiness will be offering gifts of seeds to all those he connects with during his Australia visit. The seeds are of native Australian plants, selected in consultation with Greening Australia to help support resilient and sustainable native ecosystems in the local areas His Holiness will be visiting. His Holiness will meet with Australia’s Chinese and Vietnamese communities tomorrow. Melbourne. 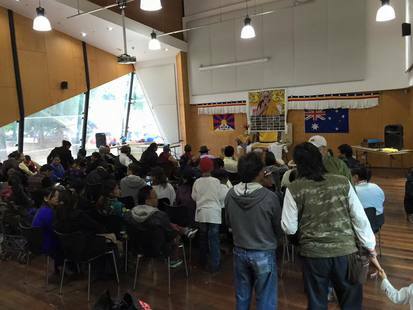 Now in two weekends the Tibetan community has swelled from around 160 to 200 with the arrival of forty new Tibetans under the Australian government’s special humanitarian program. The First flight arrived on time at 8 pm on the 15th August with 21 refugees, and an expected wait of two hours was cut short when the first family of six came through the gates just after 9pm. The airport lounge lit up like a bright new day with huge smiles of joy again and again as more Tibetans came through, all greeted with a khata from Sandup Tsering, the president of the Tibetan Community of Melbourne. Next day, Sunday 23rd Aug there was reception at the Black Rock Civic Hall located close to the beach on Port Phillip Bay. It is a small and quiet suburban hall, and who from outside could have imagined what was happening inside. There was a joyful mix of new arrival accommodation hosts, volunteers, coordinators and members and friends of the Melbourne Tibetan Community. All helping the honoured new arrivals feel at home, including nuns, monks, lay practitioners, families and singles. Greetings began with Mr. Wei Jingsheng, AKA 'The Father of Chinese Democracy', who had just flown in, is probably the world’s foremost activist for human rights and democracy in China. Mr. Wei Jing Sheng said in his speech: "the Han people and the Tibetan people are friendly. All the miseries of the Tibetan people in the past 60 years are created by the CCP. I feel happy to see another new 40 Tibetans be free from the control of the CCP and come to this free country. It's not easy to start a new life in a new country. In Melbourne, there are some members of the Chinese democratic movement. They love and like to help the Tibetan brothers and sisters, as I do. If you meet difficulties in your life such as at work and study, please contact our members in Melbourne. I believe they will try their best to help you. We will continue to support the Middle Way of His Holiness the Dalai Lama and the struggle of the Tibeten people for the freedom of Tibet. The CCP will come to the end soon and by our joint efforts, it will end sooner." Frank Ruan Jie and George Lu from the Chinese Tibetan Friendship Association of Melbourne followed, expressing their support and best wishes for the arrivals. Reminding all of their dedication to freedom of speech and human rights for all the brothers and sisters who are a part of China. Alison Ribush from Australia Tibet Council offered a very warm welcome. Outlining that ATC campaigns for the right of the Tibetan people to decide their own future and for an end to violations of their fundamental rights and freedoms. Next a Victorian Police Spokesperson continued the cordial welcoming. Offering help also in any way they can, explaining too that the police in Australia are here to protect their rights as new Australians. Ms Ngudup Dolma sang a song she specially dedicated to the new arrivals. Her voice clear confident and unaccompanied, soared so high and beautifully in the hall. Lunch followed with yummy variety of Tibetan dishes prepared and served by the Tibetans. Sandup then got down to the practical part of the day, leading all through a very thorough orientation process. All day the hall filled with laughter and conversation, and a strong sense of Tibetan spirit. Resounding with the clear notion of Tibetans wanting to sustain their unique civilization, culture and identity ... at a time when, in their homeland their culture is being exterminated at a very fast rate. The Melbourne Tibetan Community therefore grows, as another precious seed for that culture to bravely hold on until it can blossom again one day as a whole people. Just like it did for the last thousand years at least. The Dalai Lama’s Birthday unites with the formation of the Chinese Tibetan Friendship Association of Melbourne. Around three hundred people came, including fifteen Chinese. There were many local Tibetan Sangha (monks and nuns), and important dignitaries. Mr T.P. Atisha, the Representative of HHDL in Australia, New Zealand and South East Asia, Ms Jenny Mikakos, and Colleen Hartland, both are the Honourable Upper House members of Parliament, and MP For Tibet. Mr Frank Ruanje, member of the Coalition of the Chinese Democratic Movement in Melbourne and the Chief Editor of Chinese language newspaper Tian An Mien Times . 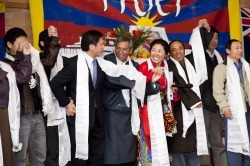 Plus members of Tibetan support groups, most prominently from the Australia Tibet Council. Mr Sandup Tsering, the President of the Tibetan Community of Victoria spoke first with a huge welcome to all with an overview of the day s events. He reminded us of the incredible achievements and capacity of the Dalai Lama, All of these qualities are but a drop in the ocean - His Holiness is truly the ocean of Wisdom , how he so successfully guided the preservation of Tibetan culture outside Tibet, keeping it alive. Also reminding us of His Holiness s words on the importance of human values. Finally, acknowledging deep gratitude to India for such vital safe haven in exile. Ms Mikakos also read a personal message from Victorian Premier John Brumby MP, where he best wishes to the Tibetan Community , going on to say I congratulate your community for hosting this auspicious celebration and for its initiative to strengthen the bonds of friendship and understanding in our community . Mr T.P. Atisha, on behalf of His Holiness thanked all for the encouragement and particularly to the many support groups and all political parties in Australia who dedicate their time, money and effort It makes a big difference for the Tibetan people . Melbourne Town Hall today hosts a photo exhibition funded and organized by the Chinese Government purporting to show the “democratic reform and social and economic development of Tibet, China in the past 50 years”. The booking for the exhibition, titled “Tibet’s Past and Present”, was made under false pretences by Chinese-Australian businessman Anson Hong, Chairman of the National Liaison Council of Chinese Australians - an organization with strong links to the Chinese Communist Party. An invitation leaked to the Australia Tibet Council revealed that Mr. Hong had acted as a proxy for the Consulate General of the People’s Republic of China in Melbourne. The exhibition, a central component in a state-driven initiative to shape international perceptions of the Tibetan situation, has been shown in a number of countries including China, Canada and South Korea. It was recently withdrawn from the Canberra Centre after a series of complaints to the venue and the Canberra Times. Officials at the City of Melbourne were unaware till yesterday of the exhibition’s link to the Chinese Government. The booking was made directly with Epicure Catering, the company contracted by the City of Melbourne to manage the Town Hall, and was being handled as a commercial booking. 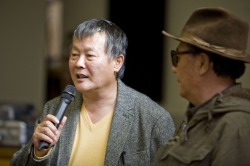 A staff member at the City of Melbourne, who wishes to remain anonymous, conceded that they had been “hoodwinked” by Mr. Hong over the exhibition. Nonetheless, contractors Epicure Catering have chosen to proceed with the exhibition and the City of Melbourne has refused to intervene. Revelation of the exhibition, advertised only through the Chinese language media, has drawn strong reactions from Melbourne’s Tibetan community. “We are very concerned and upset that Melbourne Town Hall is giving legitimacy to this exhibition. It is deeply insensitive and inflammatory towards our community and we appeal in the strongest possible terms for the City of Melbourne to intervene,” said Samdup Tsering, President of the Tibetan Community Association of Victoria. Australia Tibet Council (ATC) claims the exhibition grossly misrepresents the realities in modern Tibet and is potentially damaging towards ongoing efforts to promote dialogue and reconciliation between Australia’s Tibetan and Han Chinese communities. ATC recently published a report reveals the alarming extent of covert efforts by Chinese Government officials in Australia to influence Australian politicians, media, NGOs and universities(1). “This exhibition is a blatant example of the Chinese Government’s determination to avoid dealing with the Tibetan issue. Instead of addressing the legitimate concerns of the Tibetan people, the Chinese Government persists with its attempt to deny the existence of the problem and mislead the international community about the real situation in Tibet,” said Paul Bourke, Executive Officer of the Australia Tibet Council. The Chinese Consulate General in Melbourne sent invitations for the exhibition’s opening to members of the Victorian Parliament and local councils. Members of the Victorian Parliament and Melbourne City Council have since been advised of the nature of the exhibition and discouraged from attending. Chinese dissident groups have also expressed concern at the timing of the exhibition, which will open on the eve of the politically sensitive 20th anniversary of the Tianenman massacre. Members of the Tibetan Community of Victoria led by Sandup Tsering, Australia Tibet Council and supporters held a peaceful protest outside the Town Hall. Letting the public know that the Chinese government had tricked their way into the Town Hall to spread their propaganda about Tibet being freed from serfdom by the Chinese. That Tibet was being misrepresented by the Chinese in photos, while the real Tibetans were outside letting the public know about 50 years of terrible oppression in Tibet by the Chinese government. Two supporters of the Tibetans went into the opening, where a gathering of about 150 Chinese and two westerners viewed the contrived party line exhibition about Tibet. The speakers included Consulate-General of the People's Republic of China in Melbourne Shen Weilian, Wellington Lee, Anselm Hong and Craig Skinner of the Australia China Friendship Association (one on the only two other westerners). The speakers each went through the same party line story of the Chinese government. Craig Skinner and another speaker mention that the people demonstrating should come inside and see what it’s all about, that they knew nothing of Tibet. One of the western Tibetan supporters asked him in Tibetan "Tashi telek. Khyerang kusu depo yin bay?" ("Hello, how are you?") The guy looked confused for some reason so he explained "Diy bo kay re" ("This is Tibetan language") He still looked confused so he switched to English and said: "I've been speaking to you in Tibetan and you didn't understand a fkkn word I said did you? Do you really know all about Tibet?" He then left, disgusted. The other Tibetan supporter left and Sandup Tsering asked if he could go in, seeing two speaker had made the offer, he tried to politely go in but security refused entry. Hundreds of passers by took Tibetan protester’s flyers, many showing warm support and serious interest. This is their town, and their Town Hall. Perhaps now it’s just in name only. Time after time the Chinese government have been found to be cunning, secretive, bullying and unrelenting in their quest for the world to have one vision, theirs. Is that how you want to live? There was a strong gathering of Tibetan and Tibet Supporters outside the Chinese Consulate in Melbourne, Australia today. The weather was beautiful and hearts were strong, as united voices came together in outcry against the appalling behavior of the Chinese government, who have made March 28th 'Serf Emancipation Day'.Thus forcing Tibetans in Tibet to celebrate the loss of their leader, the loss of their freedom, the loss of their culture. It was a very peaceful but well represented protest, overseen by the friendly and cooperative Victorian and Federal Police. The event was covered by SBS TV and the international organization NTDTV, who are apparently able to broadcast uncensored into China. Prayers lead the occasion and other speakers included Tenzin Tsethar of the Tibetan Youth Group. The leafy Toorak suburb where the consulate lies, also rang with the cries 'We will never give up, China is lying - Tibetans are dying, Genuine dialogue - no more killing'. Pleas to the Chinese consulate for some fairness and justice for their people went unanwsered.